December 19, 2018 -- If you want your teenage patients to brush and floss regularly, you may want to text them. In a new study, teenage orthodontics patients who received daily text reminders showed remarkably improved oral hygiene within a few weeks. 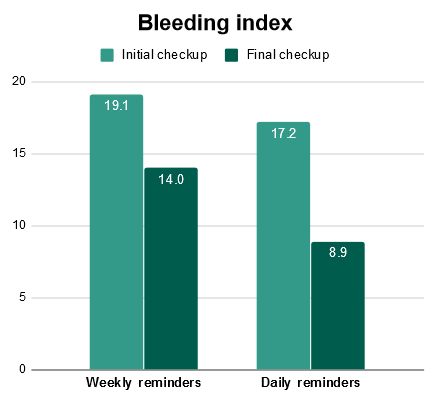 The teenagers' scores for bleeding, plaque, and gingival indexes improved with daily text reminders, and the teens also reported that the frequent texts were helpful, with some patients wanting even more frequent communication from their dentists. The study was published on December 5 in Angle Orthodontist. "Text messaging might be expected to improve compliance of teenagers, who remain connected to mobile media at various locations and at all times," wrote the authors, led by Mike Ross, DDS, a private practice dentist in Amarillo, TX. "A total of 88% of teens have access to cellular phones, and 91% of those use text messages on a daily basis." Automated text messaging is becoming an increasingly popular way to improve patient compliance, and previous studies have demonstrated that weekly text messages can help patients improve their oral hygiene. The researchers wanted to know whether daily text messages might do the same for adolescent orthodontic patients, a population who often struggles with routine brushing and flossing. To find out, the researchers enrolled 12- to 17-year-old orthodontics patients who were being seen at the Texas A&M University College of Dentistry. The patients were included if they had upper and lower braces for at least four weeks and had access to a cellphone with text messaging capabilities. About half of the 80 patients received weekly text message reminders, while the other half received daily text messages. The automated texts contained varying messages, including ones that focused on oral hygiene ("Don't forget to brush your teeth twice a day! "), shorter treatment time ("If you want your braces off faster ... be sure to keep your mouth super clean! "), and general motivation ("Research shows that a better smile leads to better-paying jobs."). After about eight weeks, both groups of patients showed improved oral hygiene. 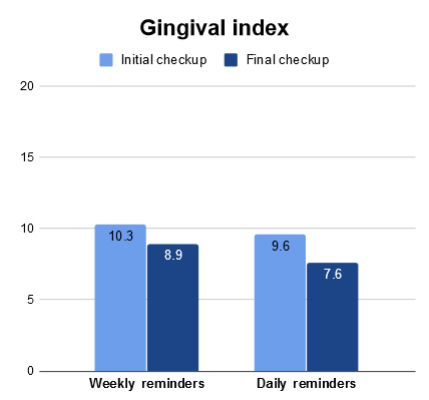 However, the scores for bleeding, gingival, and plaque indexes were significantly better for the daily reminder group compared with the weekly reminder group. "Frequency of text messages had a positive effect on compliance," the authors wrote. 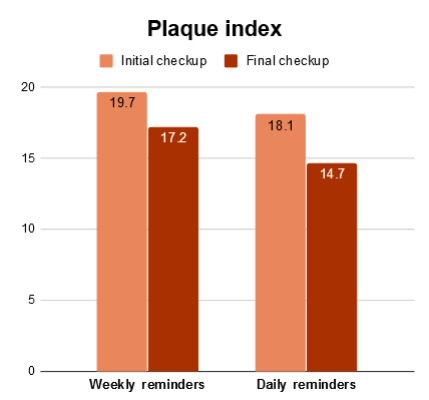 "Patients in the present study receiving automated messages daily had greater improvement in oral hygiene, with more substantial decreases in the [bleeding index], [plaque index], and [gingival index] than the weekly group." After the study was complete, the researchers sent a follow-up survey asking the patients about their experience. Of the 42% of patients who responded, the vast majority (97%) said the reminders helped them better understand the importance of brushing and flossing, and they found the messages emphasizing shorter treatment time to be the most effective motivators. Many patients also desired frequent communication from the office. Almost 40% wanted text reminders twice a day, 20% wanted reminders once per day, and another 20% wanted reminders three to four times per week. While the results were promising in the short term, the researchers were unsure of whether daily text messages could continue improving oral hygiene over a longer period of time. The results can also not be generalized to other patient populations, they noted. "The long-term effects of text messages on oral hygiene remains to be established," the authors wrote. "Although further studies are needed, it is possible that the number and timing of text messages will need to be altered over time."